KNOWING GOD SCHOOL "Living Lessons"
King's Gallery Living Lessons takes you on a deeper journey of discovery into the heart of God. A one year exploration of how Troi Cockayne came to hear the whispers and experience the presence of True Love—God. Applying the lessons taught in this course, you will discover for yourself the voice and presence of God. There's no greater pastor, teacher or friend than the Holy Spirit and He wants to be all those and more for you! Consider the cost of seeing a counselor for 1 hour versus learning to hear from the ultimate Counselor; the Holy Spirit 24/7. Troi will share from his personal experience, along with the journal entries in the book King's Gallery Living Words, as a framework to lead you into the daily, moment by moment experience of the presence of the LORD. 52 Colorful Video lessons packed with powerful Spirit filled revelations, along with bonus 'Living Concept' Videos, make KNOWING GOD easy, accessible and flexible for any schedule. 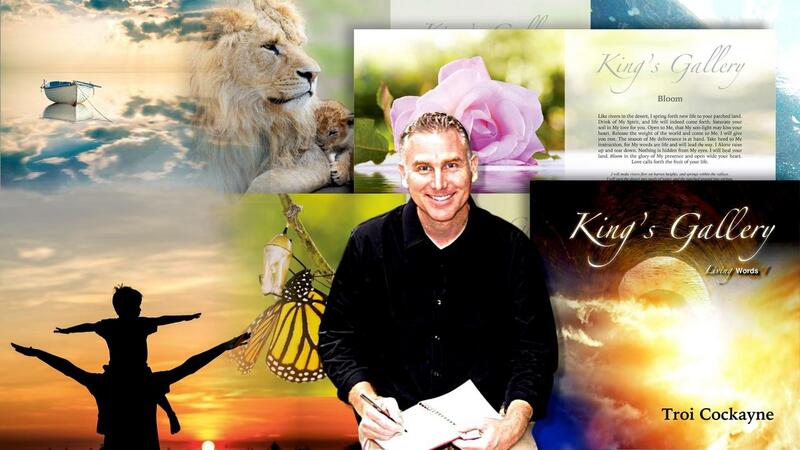 King's Gallery Living Lessons is a colorful and powerful e-course that leads you into a closer relationship with the Lord. You will learn to hear His voice, experience His presence, be led by His Spirit, walk in supernatural signs and wonders and experience deliverance! PRICE: FREE! but Donations on our website www.kingsgallery.net help this ministry grow. FREE! but Donations on our website www.kingsgallery.net help this ministry grow.